Situated inside our joint venture complex in China is our partner’s surface mount printed circuit board assembly facility. This facility has 11 PCB assembly lines. Six of these are high-speed/long run lines placing 370,000 pieces per day at a rate of 0.1 second per chip. The other 5 lines place between 12-14,000 pieces at 0.28-0.24 seconds per chip, and are used for shorter manufacturing runs. 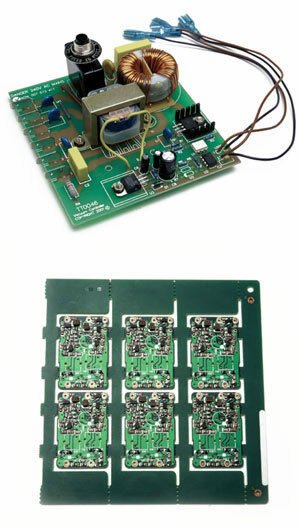 Marque Magnetics manages the PCB assembly projects and, as a wound component manufacturer in its own right, has a real competitive advantage in producing printed circuit board assemblies that include magnetics. Wound components can be procured from the "customer specified" manufacturers or Marque Magnetics can manufacture them at a highly competitive package price for the assembly.